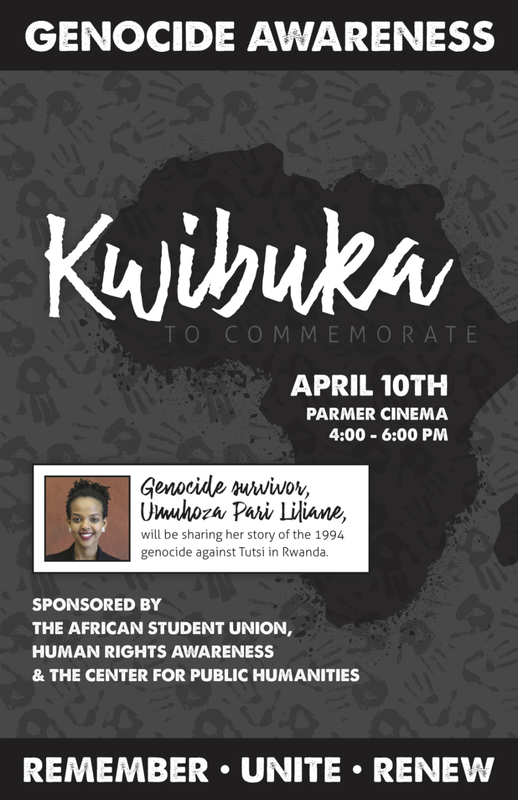 Umuhoza Pari Liliane has dedicated her life to victims of genocides throughout the world and believes that sharing stories and coming to terms with grief benefits survivors and eliminates trauma that gets passed down generations. She shared her own story in Parmer Cinema on Tuesday. “When we share our stories we heal, when we share our stories we learn from each other,” Liliane said. This is a reality that Liliane became familiar with from a young age after her father was killed in the Rwandan genocide when she was just two years old. “It gives me the strength to do what I can do to be half of what he was,” Liliane said. Although she has no memories of him, she keeps a picture of him with her as a reminder. She knows him by his legacy, of being willing to fight back against the corruption of the Rwandan government. “When the genocide started, our neighbors all ran to our house, because they thought he [my father] was going to do something,” Liliane said. Following this, Liliane experienced a rough childhood; for a year following her father’s death, she and her mother lived in a refugee camp, where they received help from missionaries who were familiar with her father. Her mother, who eventually remarried, struggled with the reality of her past, and instead chose to hide it from Liliane, telling her that her stepfather was her real father. When she finally worked up the courage to seek out the truth, around the age of 12, her mother broke down and spent a week in bed, one of the first times Liliane became familiar with the effects of trauma following genocide. “Silence is how she chose to share her story,” Liliane said. She felt as though her mother’s reaction was her fault, but the experience inspired her to help victims of genocide and attempt to begin the healing process of those who lacked access to psychological care. Following a fundraiser at her school, Liliane was able to take 30 women who had survived the Rwandan genocide on a retreat, where they began to open up about their experiences and begin the healing process. Liliane believes the key to this healing process is not an unhealthy fixation on past trauma, but rather shifting focus towards the future and how events like this can be prevented from ever occurring again. “Of course I believe we messed up the past, but if we can fix the present, we can have a bright future,” Liliane said.